AddressThe address for this sale in Victoria, TX 77901 will be available after 9:00am on Thursday, April 25th, 2019. Doors open promptly at start time. Cash, credit & debit cards are accepted. No Checks, please. All furniture must be removed by the last day of the sale. Please bring your own help for loading. We are not able to help move furniture. We will not be held responsible for accidents or injuries. Please do not block entryway or neighboring driveways. 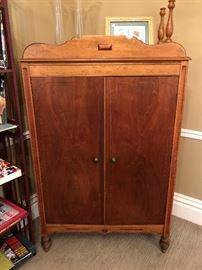 Vintage mahogany curio cabinet. Reproduction of 18th century Rococo style. Vintage mahogany hand carved fancy cut mirror and ornate console table. Reproduction styled in 18th century Rococo/Baroque. 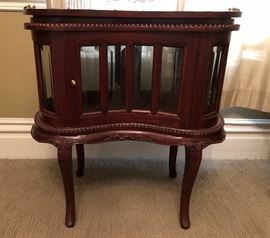 Hand carved mahogany kidney shaped end table. Removable tray. Beveled glass. 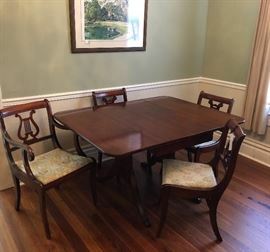 Stickley maple chair. Marked Stickley Brothers, Grand Rapids. 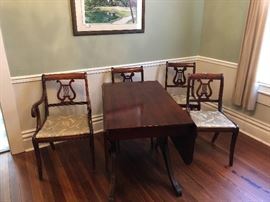 Mahogany dropleaf Duncan Phyfe table and 4 upholstered chairs. Three straight, one master. Brass feet. Absolutely beautiful condition! 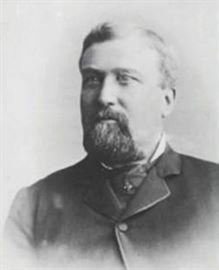 Pictured is J. M. Brownson. According to Victoria builder B.J. Davis, the lamppost shown on the next image was salvaged from the Brownson Home for Children. When Mrs. J.M. Brownson (maiden name Catherine “Kate” McDow) died April 15, 1932 she left $100,000 in her will for the establishment of a children’s home / orphanage. She stipulated in her will that the children were to be raised in the Episcopal faith. According to Victoria builder B.J. 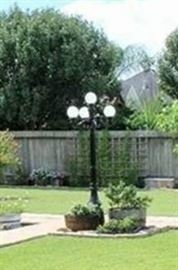 Davis, this lamppost was salvaged from the Brownson Home for Children. When Mrs. J.M. Brownson (maiden name Catherine “Kate” McDow) died April 15, 1932 she left $100,000 in her will for the establishment of a children’s home / orphanage. She stipulated in her will that the children were to be raised in the Episcopal faith. Victorian style Gossip Bench. Jacquard upholstery, side table with drawer. 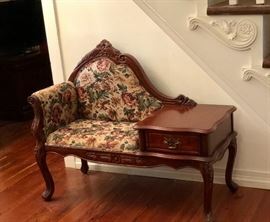 Hand carved mahogany in true Victorian. Style. 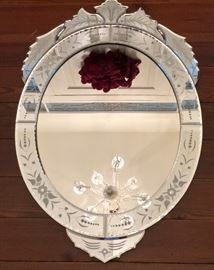 Venetian style foliate glass wall mirror. Reversed etched, floriform crest over applied beveled embellishments. English wardrobe used for entertainment center. Birdseye maple. 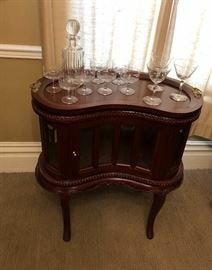 Modern classic Empire style end Table. Mahogany finish, one drawer, bun feet. Original oil by Harold Nichols. Untitled but depicts breaking waves on a stormy night. Dated 2007. Tall black storage cabinet. Top and bottom glass front cabinets with five shelves. Bokara terra-cotta rug. All over “elephant foot” pattern. Wool. 6.5 x 4.2. Perfect condition. Hand woven in Pakistan. Silver studded with silver feet upholstered bench. Perfect for resting your feet, handy when you need extra seat seating. Nice vanity bench. Westinghouse 32 inch LED TV. Works but will require a universal remote control. English wardrobe. Versatile size. Will fit easily into a corner. Inside has mirror, hangers, hooks, and cedar floor. Original hardware, locks. Mahogany cedar chest. Lined, of course, with cedar! One of two matching bedside or end tables. Mahogany vanity with triple beveled mirrors. Collectible books, fun books, and ephemera. Two matching Tuscan style marble and metal table lamps With glass shades. English countryside decorator art. German anniversary clock runs on motion and keeps perfect time. German anniversary clock. No batteries needed, runs on motion, keeps perfect time. Set of six elegant glass compote/champagne coupes. Etched and cut brilliant glass bowl. Sawtooth rim. Ribbed Crystal whiskey decanter. Vintage edged compote/champagne coupe. Set of four elegant glass goblets. Herend vase. Queen Victoria pattern. Made in Hungary. Ainsley fine English bone china. “Portrayal of the Flora in an English Cottage Garden” pattern. Veined leaf glass bowl. Silverplate base. New in Box. Leather laptop/briefcase. Brass zipper, handstitched trim. Original box. From Restoration Hardware. Grecian inspired porcelain box. Made in Portugal. Storage cubes, perfect for seating or foot rest, or storage! Pewter/silver embossed hammered metal table. Metal over wood. Tooled and hammered metal over wood trays. Vintage fancy cut beveled mirror. Decorator trunks. Old military brass button cleaning board. Birdseye maple candle sticks. Antique lady’s travel/grooming kit. Circa 1930s.